With ash coloured floors and dark cabinets, I naturally gravitated to some light greys for paint colours. I used Benjamin Moore’s “Granite” from the Affinity collection for the accent walls in the Master bedroom and the living room. For the rest of the walls, “Nightingale”, also from the Affinity collection, complemented my first colour choice. These colours were mainly grey with a hint of brown – picking up on warm and cool colour choices throughout the suite. When selecting furnishings for the suite, the focus was to find durable pieces and optimal comfort. It was important to purchase high end mattresses and a great comfortable couch. Serta’s Posturepedic from the Trump Home line was a great choice for the bedrooms and Urban Barn’s “Cedric” couch (a favourite) was showcased in the living room. The Cedric, with plush grey wool jacket fabric, created a soft palette allowing any colour of pillow to work well with it – an opportunity to infuse blasts of colour into the suite. Years of property management experience have taught me to listen to what our corporate housing guest like – a less institutional feel. To combat that, texture has always been an important addition to any project: a lavish rug, decorative curtains and plenty of plush pillows. The rug and curtains came from Urban Barn. The pillows were great finds from multiple trips to Homesense. Small decorative items also gave the suite the feel of a 5 star hotel. 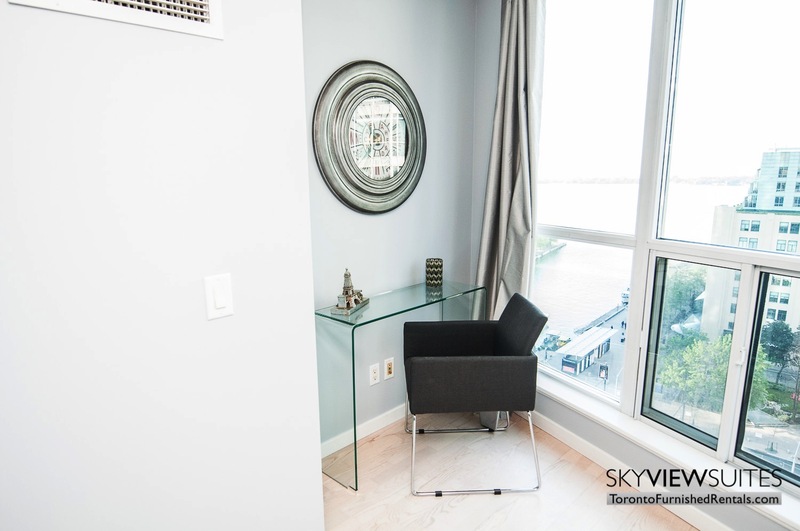 At Sky View Suites, we take pride in providing our guests with the best version of home that we can come up with. We understand the needs of the weary traveller that look to the short term rental market for accommodations in Toronto. If you are looking to try renting a place on your own and furnishing it for the Toronto furnished rentals market, always think about what will make your guests happy. If they are happy, the will take pride in living in your suite – the best type of tenant to have.